Yes, I know you all think @indierockgirl is a one trick pony with my never ending array of garage rock recommendations, but I do dabble in a little indie pop now and then. Mostly the British variety (don’t ask me why) and Jim Noir is one of those artists, much like The Bees and The Beta Band, that I have a big soft spot for. 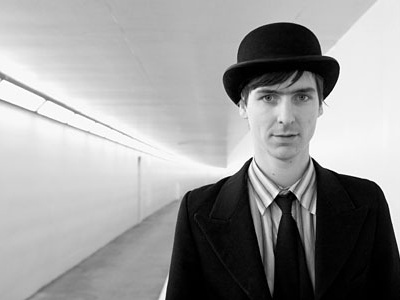 Jim is a quirky, eccentric, bowler hat wearing guy that does an excellent job of making psychedelic pop. Eanie Meany, My Patch and Tower of Love are some of my favorites. His new EP, Zooper Dooper, is out now and available for mere 4 quid. Buy it here. This entry was posted in Spanking New Music and tagged cars, jim noir, zooper dooper. Bookmark the permalink. Sounds like Flight of the Conchords penning Lyrics for Strawberry Alarm Clock.